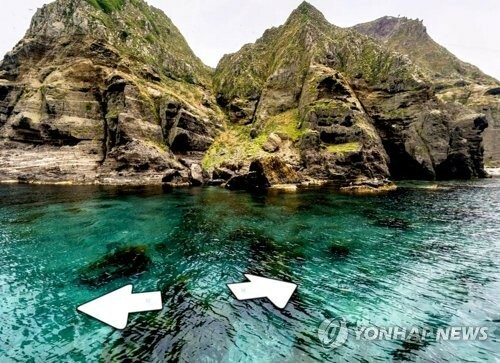 SEOUL, Aug. 14 (Yonhap) — Naver Corp., South Korea’s top Internet portal operator, said Monday that it has added updated images of the Dokdo islets in the East Sea to its online map service just ahead of the 72nd anniversary of the country’s liberation from Japan’s colonial rule. South Korea celebrates Liberation Day — a major holiday to mark the anniversary of Korea’s independence from Japan’s 1910-45 colonial rule — on Tuesday. The new photos include a lot of fascinating underwater imagery and views of the rocky outcroppings around the islets, Naver said. The photos were taken last month. “The photos were added so that users can feel the real scenic view of Dokdo and realize the true meaning of Liberation Day one more time,” said a Naver official, who asked not to be named. The islets have been the subject of a territorial dispute with Japan for years. Earlier, Tokyo announced the publication of its defense white paper for 2017 in which they claimed Dokdo is part of its territory. It marks the 13th straight year Japan has laid claim to the rocky islets lying between the neighbors in their annual defense paper.